China’s foreign minister says his country has stopped its controversial land reclamation project in the South China Sea. Wang Yi commented at the ASEAN (Association of Southeastern Asian Nations) forum in Malaysia on Wednesday, where he met with U.S. Secretary of State John Kerry. Reporters asked Wang about the project that has pitted China against some of its neighbors who also have claims on the waterway. He said, “China has already stopped.” Wang told reporters they should take a plane and look for themselves. Earlier Wednesday, Kerry expressed his concerns to Wang about China’s large-scale reclamation and construction on islands, including some which appear to have military features. A senior State Department official said Kerry reiterated his concern about rising tensions in the South China Sea, which is one of the world's busiest shipping lanes. "The United States shares the frequently expressed desire of ASEAN members to preserve peace and stability in the South China Sea," said Kerry in opening remarks at the ASEAN - U.S. ministerial meeting. The group wants to "see that disputes in the area are managed peacefully and on the basis of international law," he added. The United States and the Philippines have urged China to freeze its land reclamation projects. Beijing has rejected criticism of its efforts. A senior State Department official said Kerry and Wang also discussed concerns about cyberspace, human rights issues and President Xi Jinping's planned U.S. visit in September. Kerry welcomed Turkey’s recent decision to open its military bases to U.S. flights in operations against Islamic State militants in Syria. U.S. Secretary of State John Kerry, left, and Turkey's Foreign Minister Mevlut Cavusoglu wait for a meeting in Kuala Lumpur, August 5, 2015. A senior State Department official says Kerry reiterated the U.S. commitment to promoting conditions that would lead to a negotiated settlement to end Syria’s conflict, as he met with Foreign Minister Mevlut Cavusoglu. Heading into the talks, the foreign minister said efforts had begun to train and equip the moderate Syrian opposition. Last week, Turkey launched airstrikes against Islamic State targets in Syria, as part of the U.S.-led coalition effort to fight the militants. Kerry and Russian Foreign Minister Sergei Lavrov also met on the sidelines of the ASEAN session Wednesday. The State Department says they discussed Ukraine’s unrest and steps needed to fully implement the Minsk cease-fire agreement. The Ukrainian government has been battling Russian-backed separatists. Kerry and Lavrov also discussed Syria’s unrest during their second meeting this week. On Monday, they joined Saudi Foreign Minister Adel al-Jubeir for talks in Qatar, during a Gulf Cooperation Council meeting. The State Department says Kerry “noted” the steps that Malaysia had taken to address human trafficking but urged the government to continue efforts to improve law enforcement and programs to protect victims. 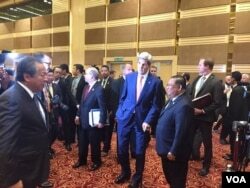 Kerry raised the issue during wide-ranging talks with his Malaysian counterpart, Foreign Minister Anifah Haji Aman. On Thursday, the U.S. Senate Foreign Relations Committee is set to probe the State Department’s annual human trafficking report, which was released last month. Lawmakers called for the hearing after the Reuters news agency reported the decision to give countries including Malaysia and Cuba more favorable ratings was based more on politics than actual changes within the countries. The foreign minister and Kerry also discussed the South China Sea dispute and the Trans-Pacific Partnership, a 12-nation trade plan that includes Malaysia. Kerry entered the forum using a cane instead of crutches — a first since he broke his leg in a June biking accident. In comments at one session, he said the cane was loaned to him by President John F. Kennedy's family and dated back to the late president's father, Joseph Kennedy, who served as U.S. ambassador to England. Kerry is in Southeast Asia to stress the importance of U.S. trade and investment and links to prosperity for the Asian and U.S. economies. Kerry arrived in Kuala Lumpur late Tuesday from Singapore, where he held talks with officials on issues including the proposed Trans Pacific-Partnership (TPP). In a speech at a Singapore university, Kerry said trade ministers involved in TPP talks had made "good progress;" however, the ministers failed to reach a final agreement last week during talks in Hawaii. Kerry is on a five-nation tour that included stops in Egypt and Qatar. Some material for this report came frm Reuters.